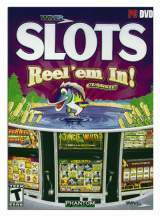 WMS SLOTS - Reel Em' In! Classic © 2011 Phantom EFX. WMS and Phantom EFX have partnered up for the first time ever to bring you the glitz and glamour of real casino slots on your home PC. This DVD boasts 20 of WMS Gaming's top slot machines that have ever hit the casino floors. Unlock new slots and achievements as you spin and win! "Jackpot Comet [Hot Hot Super Jackpot]"
"Reel 'Em In [Classic Series]"
"Double Easy Money [Hot Hot Super Jackpot]"
and one secret slot (don't click if you don't want to know its name).